Available in four color-coded, solid polyethylene mandrel diameters, Easybend Pipe Bender comes in 4-m length which closely fits with copper lineset tubing sizes of 4 mm, 6mm, 9 mm and 12 mm OD. Preventing collapsing and kinking by making up to 180° bends, unit allows for tight radiuses simultaneously bending both lines without kinking. Used in 14°F to 113°F temperature range, product is packed in 18 sq-in. reusable carrying bag. Marketair Inc., an Edison, N.J.-based supplier of specialized HVAC/R components and accessories, introduces easybend by Castel Engineering, the industry's quickest, easiest and most reliable soft copper pipe bender that eliminates variable refrigerant flow (VRF) and minisplit lineset installation kinks. Marketair specializes in ductless air conditioning tools/accessories and is the exclusive easybend importer/distributor for the North American markets. Conventional pipe benders need pre-installation bending calculations, are labor-intensive, limited in radius capabilities, can handle only one line at a time, and require pipe insulation removal. Instead, linesets in which easybend is inserted can be precisely bent manually while passing through walls and around obstacles during installation. 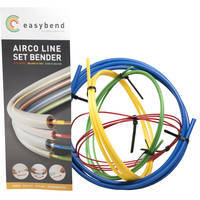 The easybend is 11 feet longer than bending springs and is easily extracted after use. Available at most HVAC/R wholesale distributors, the easybend kit is packaged in a transparent, sturdy plastic, 18-inch-square reusable carrying bag with a cardboard hang-tag for J-hook merchandising or hanging on service truck shelving. And eliminates kinks, which are concealed in walls or hidden under insulation and can subsequently develop leaks and/or restrict refrigerant flow, resulting in refrigerant loss and reduced cooling capacity. This is the first introduction of Belgium-based Castel Engineering's easybend in North America after a successful debut in Europe last year. For more information on the easybend or other innovative Marketair products, please visit www.marketair.com, call (732) 985-8226 or email info@marketair.com. About Marketair: Originally founded by President Gerry Spanger as a manufacturer's representative company in 1986, Marketair has now reinvented itself as an importer, exporter, manufacturer and distributor specializing in components and accessories for the HVAC industry. Headquartered in Edison, N.J., Marketair has acquired several innovative new products for commercial and residential HVAC applications, covering both the ducted and minisplit (ductless) sectors. Marketair also operates as a national distributor for smaller independent U.S. manufacturers. The company has established a national network of manufacturer's representatives through which these products are sold in the HVAC/R industry's wholesale distributors. It has also established a centrally-located warehouse for shipping products throughout the U.S.